Or more worryingly someone spent near on 30 days trying to overclock to 4.1 ghz and when they could only do It by putting 1.5v into it they decided to return it so they could try another instead. I wouldn't buy a used CPU with an unlocked multiplier. Beware. Is this just damaged packaging? It worries me when things like this are in the warehouse. Has the person jammed it into the wrong socket type!? I got a 1500x from the warehouse a couple of months ago, the box only had the stock cooler in it with no cpu. One of the few times I've had trouble with amazon customer service, initially they wouldn't refund until they had done an investigation, it took screaming at a supervisor to get that sorted. I’ve had a couple of graphics cards from the warehouse this year. One seemed to be just a damaged box, all the packaging was sealed. The other had been opened but didn’t seem to have been used (maybe it didn’t fit in the case as it was pretty long). i saved about £100 on each one. With a CPU it may be a little more risky, but if it’s no good you can return it. If it has been used the thermal paste on the cooler will have come off. I’ve bought loads of stuff from the Amazon Warehouse before - it’s even better with the 20% off offer but that’s rare (and just finished). Though I’ve seen some terrible things... I had an RX 480 4GB graphics card that someone had flashed an RX 470 8GB BIOS onto it in the 2nd switch position (so it wouldn’t boot - I reflashed it and kept for a 20% refund), a handful of motherboards where the LGA pins were bent or missing, modular PSUs where the modular cables are missing... but I keep buying as normally it’s fine and the savings are too much to pass up on. Amazon’s customer service is worth it too, they will fix or resolvemost things without fuss. I’ve bought loads of stuff from the Amazon Warehouse before - it’s even bet …I’ve bought loads of stuff from the Amazon Warehouse before - it’s even better with the 20% off offer but that’s rare (and just finished).Though I’ve seen some terrible things... I had an RX 480 4GB graphics card that someone had flashed an RX 470 8GB BIOS onto it in the 2nd switch position (so it wouldn’t boot - I reflashed it and kept for a 20% refund), a handful of motherboards where the LGA pins were bent or missing, modular PSUs where the modular cables are missing... but I keep buying as normally it’s fine and the savings are too much to pass up on. Amazon’s customer service is worth it too, they will fix or resolvemost things without fuss. My experience almost mirrors yours, i buy almost all my hard drives from amazon warehouse in the 20% off sales because they're sometimes new and almost always under the magic £20 per gb price point. My experience almost mirrors yours, i buy almost all my hard drives from …My experience almost mirrors yours, i buy almost all my hard drives from amazon warehouse in the 20% off sales because they're sometimes new and almost always under the magic £20 per gb price point. The 20% discount used to be even better when you could stack it with the 20% student discount. But I think they've stopped that now. But we've made some very good purchases through warehouse deals. Maybe im looking wrong, but hasnt this expired? Yeah it has now,I checked this morning it when it still had a few left but now it seems to be all sold out. Or more worryingly someone spent near on 30 days trying to overclock to …Or more worryingly someone spent near on 30 days trying to overclock to 4.1 ghz and when they could only do It by putting 1.5v into it they decided to return it so they could try another instead. I wouldn't buy a used CPU with an unlocked multiplier. Beware. 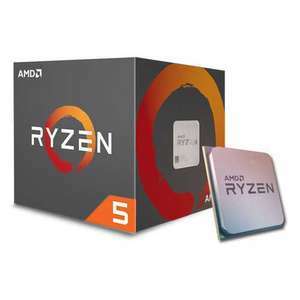 or they simply pull the old switcharoo and return the box with an old athlon in it instead, the warehouse staff are probably too under-qualified to know the difference and too underpaid to care.